Dit Engelstalige blogbericht verscheen op 10 februari 2016 ook op Medium. 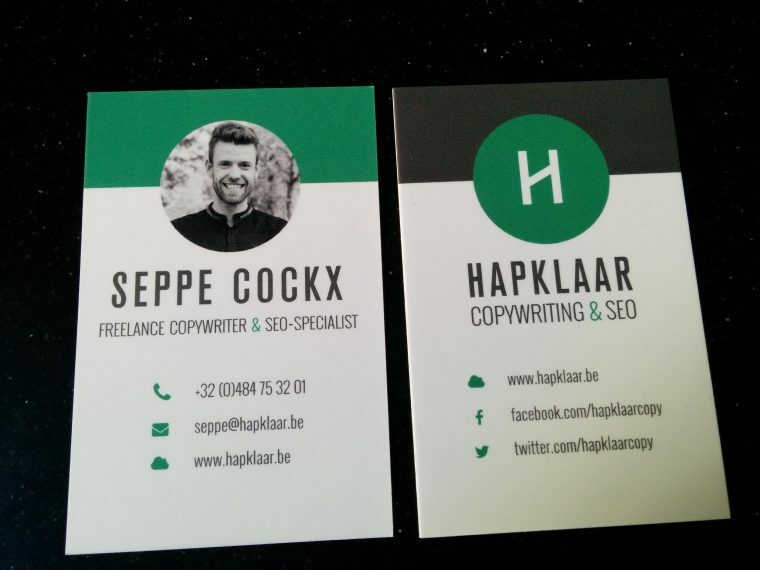 I recently had business cards made to promote my freelance services. Since I put quite some time and effort into devising an effective card, I decided to share my lessons learned. 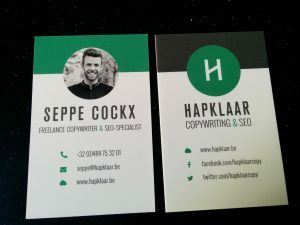 Here are my 5 tips for turning your business card into a business-generating card. This really is my number one advice: add a profile picture to your business card. It’s especially true for salespeople, but it basically goes for everyone. Imagine your sales lead going home after a conference. The next day, she finds about fifteen business cards in her wallet. How will she remember which one was yours? That’s right: she needs to see your picture, or your pleasant chat never happened. Also, faces build trust. That’s marketing and sales 101. 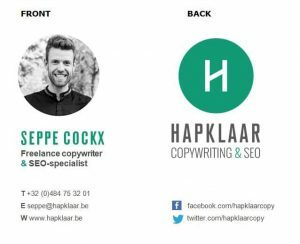 Want your business card to stand out? Add a profile picture and you’re already in the top 1 percent. In my professional life, I meet most people online first (on LinkedIn or Twitter) and offline second. Still, I have gathered about one hundred business cards over the past few years. I checked all of them: only one had a picture on the card. Want yours to stand out? Add your own smiley face and you’re already in the top 1 percent. A second thing that struck me during my limited market research? Data overload. People seem to love sharing digits. Think VAT, fax and bank account numbers. Why would you tell a prospect right away how she should pay you in the future? Save the bank account details for your invoice. Do you prefer someone to learn your VAT number by heart or do you want them to get in touch? Just add the VAT information to your company website. And do you really like leads to contact you by fax? Stick to your phone number and email address. That way, your lead can’t fall victim to the paradox of choice, either. Marketing and sales 101, round two. Confession: I like my business cards regularly sized. The really small ones sink into the infinite abyss of my wallet and the big ones don’t fit my business card book. If you’re handing out weirdly-shaped business cards, chances I’ll get back to you are decreasing. By the way, you don’t need to stand out with a crazy card size. Thanks to your picture, you’re already different, remember? Add some personality with a portrait orientation instead of the landscape format. That is way less common, and it doesn’t cost you a cent more. Don’t worry, though. I am a copywriter, so I’m not completely against creativity. If a deviant shape is relevant for your business, go for it. I once received a postcard-sized business card from a client and I loved it. Why? He was selling larger-than-life everyday objects, like pencils the size of a forearm. Do you still feel that standard-sized business cards are a bit bland? Good, so do I. In that case, add some personality with a portrait orientation instead of the landscape format. That is way less common, and it doesn’t cost you a cent more. If you’re anything like me, you love to do as much as possible yourself. And that includes designing business cards, even though you have no knack for design whatsoever. Sounds familiar? In that case, you need help. I’m serious. Call a designer. Indeed, there are so many business card design and print companies out there. But their templates are too generic, whilst custom designs have to respect their guidelines to the millimeter. I don’t want to spend several hours creating and uploading a mediocre design that might have parts chopped off in the cutting process. And you shouldn’t either. Use that time to get work done and ask a designer for one hour of his or her time. I asked him to add just something extra to it in 1 hour’s time, without losing the overall simplicity of the design. And of course, I wanted him to guarantee the cards would come out of the production process just right. Well worth the tiny investment, don’t you think? Don’t choose your business card material on a screen. Even most online suppliers offer a sample pack. Order it (woohoo, free gift!) and feel the materials for yourself. I for one don’t care too much for glossy finishes. I do, however, am concerned about the thickness of the paper. I want it to be thin enough to be able to stack several cards in my own wallet, but thick enough to prevent the cards from wrinkling in someone else’s wallet. Too many details? No, thanks. Small, regular or large? Regular will do. To call a designer or not to call one? Grab that phone. Sample cards? Send them over! These tips will not win you any design awards. But they do improve your networking ROI. Are you planning any changes to your own cards now? Did I leave out the one advice to rule them all? Or do you very politely disagree with all of the above tips? Please let me know in the responses section. 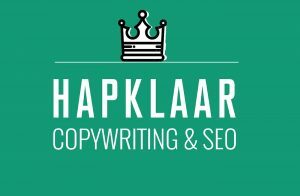 Vaarwel, voorlopige website. Welkom, volwaardige digitale thuis. Hapklaar.be hangt eindelijk in de lucht. Geef jij feedback en verspreid je het nieuws? 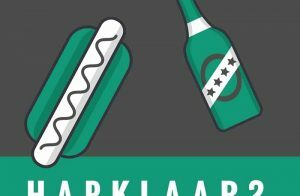 Vanwaar komt de naam ‘Hapklaar’? Is Hapklaar een broodjeszaak? 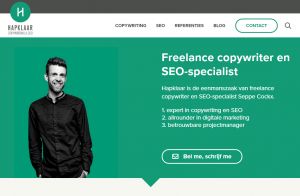 Nee, je vindt er alleen copywriting en SEO op het menu. Ontdek waar de bedrijfsnaam vandaan komt. Op 2 april 2016 blaast Hapklaar zijn eerste kaarsje uit. Tijd voor een terugblik, wat dankjewels en een verjaardagsfeestje.